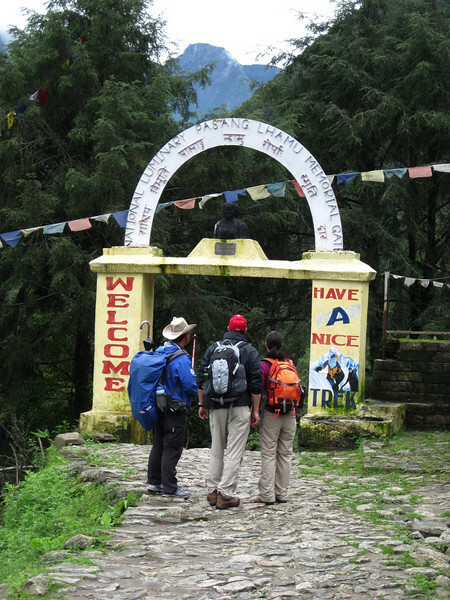 As you leave Lukla and enter the Khumbu valley proper, you pass through this little gate. It's a memorial to Pasang Lhamu Sherpa, first Nepali woman to climb Everest (on 22 April 1993, also my Mum's 76th birthday). Sadly, she died just 18 days later after falling into a crevasse on the descent. One biography on the web says she died on the south summit after trying to save the life of a fellow climber, Sonam Tshering, who got sick but also died. Perhaps that explains the time lag between summit and descent. She was 31 years old.